Python Django is a web application. It is a high-level Python framework used for the development of secure and maintainable websites. 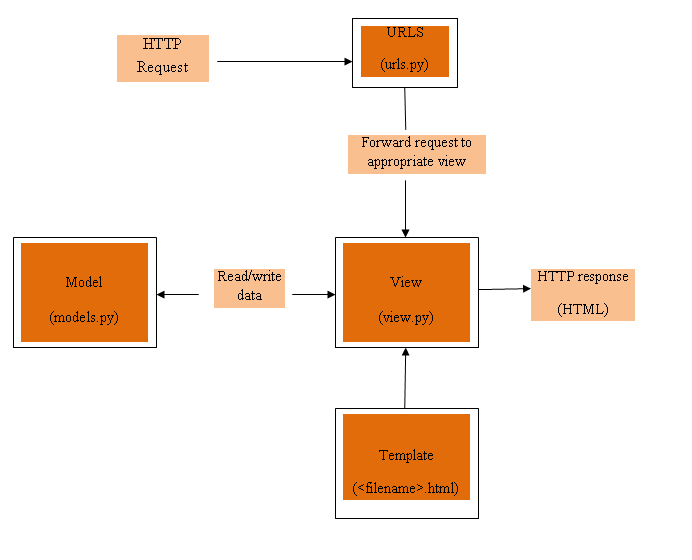 Django is based on MVT(Model View Template) design pattern. Due to its rapid development pattern feature, Django is on very high demand. Django cares about troubles in web development. Programmer can write code without worrying about the appearance. Using Django for web application after collecting client requirement takes less time to build. It is built in such a manner that it can handle things automatically. Django uses a famous tag line “The web framework for perfectionists with deadlines”. Django uses the opinionated framework. Opinionated frameworks provide options about the right way to handle any particular task. It supports rapid development for a particular domain because the right way to do anything is usually well-understood and well-documented. Opinionated frameworks are less flexible in solving problems outside of their main domain. It is possible to request every single URL using a single function. Using a single function makes it easy to maintain and handle resources. URL mapper is used to redirecting HTTP request on the requested URL. URL mapper is used for matching pattern of string or digits which appear in an URL and this URL is passed to view function as data. It is a request handler function. It is used to receive HTTP requests and the HTTP responses in return. View is used to access data using models and templates. In Python, models are the structure of an application’s data. It also manages and query records in the database. It is a text file used for defining the structure of a file. It also uses a placeholder to represent content. View creates dynamic HTML page using HTML templates. It is not important that Templates should have HTML. In 2003, Lawrence journal world designed and developed Django. In 2005, Django was publicly released under BSD license. At present, Django Software Foundation (DSF) maintains its development. 2.0.3 is the current version of Django, which was released on 6 March 2018. 1.3 23 Mar 2011 Timezones, in browser testing, app templates. 1.6 6 Nov 2013 Dedicated to Malcolm Tredinnick, db transaction management, connection pooling. 1.7 2 Sep 2014 Migrations, application loading and configuration. 1.8 LTS 2 Sep 2014 Migrations, application loading and configuration. 1.8 LTS 1 Apr 2015 Native support for multiple template engines.Supported until at least April 2018. 1.9 1 Dec 2015 Automatic password validation. New styling for admin interface. 1.10 1 Aug 2016 Full text search for PostgreSQL. New-style middleware. 2.0 Dec 2017 First Python 3-only release, Simplified URL routing syntax, Mobile friendly admin. Django is a lightweight & standalone web server. Template system uses the concept of inheritance. Several cache methods can be used by any caching framework. Internal dispatcher system allows pre-defined signals to communicate with the application. Serialization system is used to read XML and/or JSON. It provides a built-in unit testing interface to Python’s. Fast: It is designed to help developers to make application fast. Django is cost effective as well as efficient. It is an ideal solution for developers who focus on deadlines. Fully Loaded: It has extra features like user authentication, sitemaps, content administration etc. These help the web development process to carry out completely. Secure: Using Django, developers cannot make any mistakes like SQL injection, cross-site request forgery, etc. the user authentication system is the key to manage username and password. Scalable: Using the Django framework, heavy traffic demand can be handled. Versatile: Big organizations, Content management etc. uses Django for efficient management. To specify URL, it uses routing pattern. Everything is based on Django ORM. All the components are deployed together. Is Django a good web framework choice? Since the creation of the framework’s Django project’s stability, performance and community have grown up. There are lots of tutorials present on the web and in books. This framework is continuously growing by new functionalities such as database migration. It is recommended to web developers to use the Django framework because it has official documentation and tutorials for software development. Django District, Django Boston and San Francisco Django are the groups present in many cities to help developers if they are stuck.